The open worlds of Infamous games have given Sucker Punch the opportunity to create downloadable content that avoids the feeling of mere fluffy extras. The studio explored a Halloween-themed vampire story the Festival of Blood for Infamous 2, and now Second Son has gotten its own self-contained piece of extra content: First Light. This one ties directly into the events of the main game, and as a result feels like a tight and well-constructed piece of the Infamous universe that can't help but have a few redundant story hooks. First Light stars the neon-powered Abigail "Fetch" Walker, recalling the events that led to her capture by the Department of Unified Protection while she's being groomed by the same organization as a living weapon. Fetch was always the most interesting side-character in Infamous: Second Son, and arguably more so than protagonist Delsin Rowe, so I was glad to spend more time with her. Her story is somewhat held back, though, since I already knew the most emotionally resonant part. I'll avoid specifics since as a standalone, some could play First Light before Second Son, but suffice to say anyone who has played Delsin's adventure already knows her tragic story. Sucker Punch attempts to add a few more twists, but they fall flat next to the one we already know about. It also lacks the duality of choice that has defined the Infamous games, and with it goes some replay value. The "good or evil" mechanic from past games has been too binary, but it at least gave us a reason to play again and see different outcomes. This is a much more straight-forward story, and moments that feel like they were made for choices end up leaving you with only one option. That said, the shorter story structure works well for a game like this. Video game narratives are difficult to sustain over the course of 10 or 20 hours, so a condensed version that lasts just three or four hours isn't stretched so uncomfortably. It gets its points across and avoids overstaying its welcome. This is bolstered by the solid mechanical underpinnings from Second Son, repurposed for Fetch's story. I was skeptical about how enjoyable it would be to play with a single set of powers, after Second Son made a point of swapping between four different powers. Fortunately, Sucker Punch foresaw this limitation, and made Fetch's powers more rounded on their own. The addition of new tools drive home the point that Delsin may have been able to borrow suites of powers, but the individual Conduits like Fetch are really the ones who have mastery over it. My favorite new addition was the speed boost mechanic. Small rings of neon scattered liberally throughout Seattle give the dashing ability a little extra kick. Neon already provided the best mode of travel in Second Son, and the ability to aim for small boosts in speed rather than simply run in a straight line makes it even better in First Light. A variety of slightly tweaked combat tools help Fetch's arsenal stand on its own, but the game doesn't provide much reason to use them. Combat is kept to a minimum throughout most of First Light, aside from three battle arenas that gate story progress. These were clearly intended to promote the arenas, since they can also be played individually for high scores, but I never felt tempted to go back to them after the required encounters. The pacing felt unpredictable--slow and boring in one encounter type, frustrating and overwhelming in another. First Light does wisely take some lessons learned from Second Son, though, including framerate lock and time-of-day options, and a revised Photo Mode with more filters. It also once again showcases some of the best facial animation tech of this generation, as characters show minor ticks in their expressions that accent the storytelling. 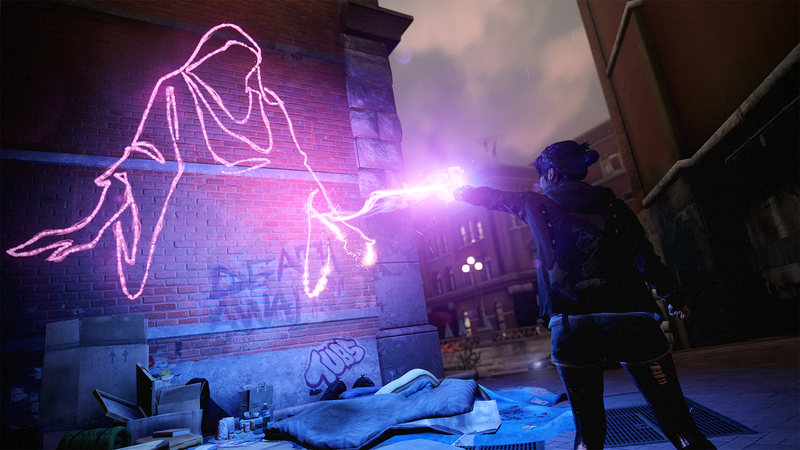 Infamous: First Light is at its best when it's iterating on and riffing on Second Son. In many ways, the abbreviated length of First Light makes it a better bite-sized package. It's more linear and less surprising than fans might expect from the series, but exploring this world as Fetch is just as fun as it ever was. This review is based on a downloadable PlayStation 4 code provided by the publisher. Infamous: First Light will be available on the PlayStation Network today, for $14.99. The game is rated T.
Steve Watts posted a new article, Infamous: First Light review: neon gas. Awesome, I have to pick this up today can not wait.